While on our recent West Coast vacation, we spent a jam-packed day and a half in San Francisco. We had a wonderful time! 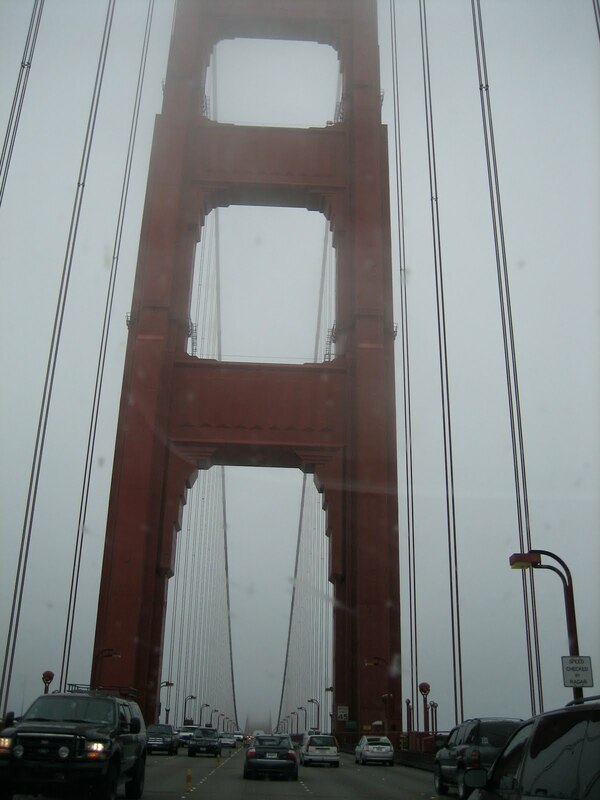 As we drove into San Francisco, we planned our route so we would be sure to drive over the Golden Gate Bridge (thank goodness for GPS!). After arriving at the hotel, we took a cable car down to Fisherman's Wharf for lunch and sight-seeing. We at lunch at the wonderful Boudin's Bakery. Both Mike and I had a bread bowl filled with soup and Matthew had a pizza. Then Matthew had some of the tops of both Mike and I's bread bowls. The kid LOVED sourdough bread. We continued our stroll along the Wharf and bought boat tickets for a boat tour through the bay. As soon as we bought the tickets, Matthew commented that he didn't feel so good. Turns out, he had a little too much sourdough bread. Let's just say, we now call it "Fisherman's Barf"... Luckily after that little episode he was fine. We took a great boat ride through the bay and got to see the Golden Gate and Alcatraz. After this, we walked around Pier 33 and did a little shopping. We then headed for dinner down at Ghiradelli Square and finished the night off with ice cream at Ghiradelli's. The next morning, we walked down from our hotel and had a great breakfast. 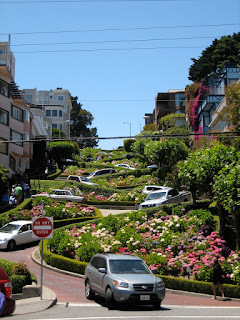 We then headed to Union Square on a cable car, and back to Lombard Street- the crookedest street in the country. 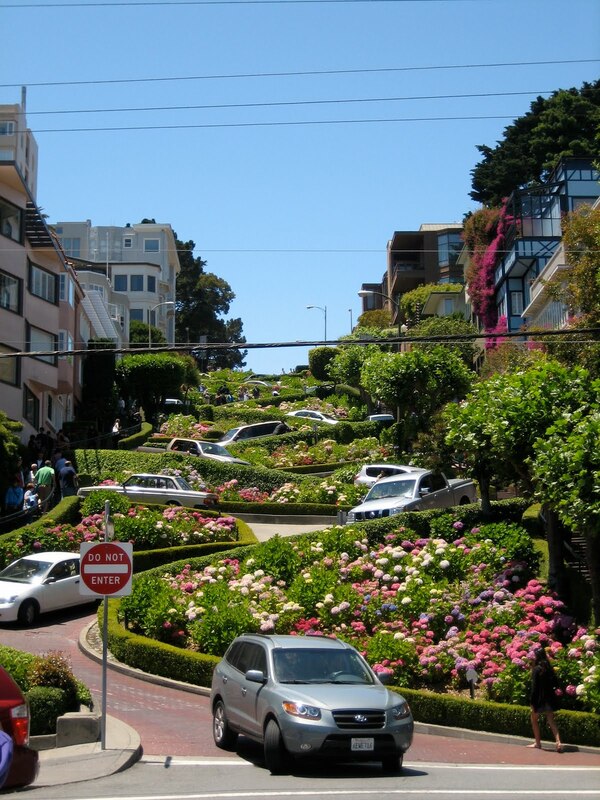 It is a very crooked street, with some gorgeous views! After this, we went down to Pier 1 to check out their amazing Farmer's Market. We picked up cheese and bread for lunch and ate it while overlooking the bay. We decided to take a bike ride from Fisherman's Wharf to the Golden Gate Bridge. It didn't look that far... Well, it is that far (about 3.5 miles each way!) and uphill on the way to the bridge. But that wasn't the worst part- crossing the bridge was COLD, windy, and foggy. After we crossed the bridge to the Sausalito side, we could either choose to continue into Sausalito and take a ferry back, or just bike back across the bridge and back to the Wharf. We opted to bike back across the bridge. We then returned the bikes and went for a yummy seafood dinner at Scoma's before calling it a night. Seeing my husband's family and Matthew getting to know his cousins. They quickly became the best of friends. Watching the changing landscape as we drove from Portland, Or. to Anaheim, Ca. We saw desert, mountains, cliffs, etc. It was quite impressive. Spending time with my grandmother, who I hadn't seen in 20 years and who had never met Matthew or Mike. I also got to see aunts and cousins I hadn't seen in many, many years. 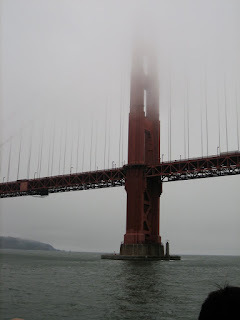 Our weekend in San Francisco: Thanks to Matthew we now refer to it as Fisherman's Barf, and we also biked across the (cold and windy) Golden Gate Bridge. Exploring Disneyland and California Adventure- and being lucky enough to see World of Color twice! All in all it was a great trip!